With the availability of indoor plumbing, an outhouse is not a necessity for most homeowners today. Instead, most existing outhouses serve as nostalgic reminders of simpler times, while others are transformed into vintage, decorative yard art. 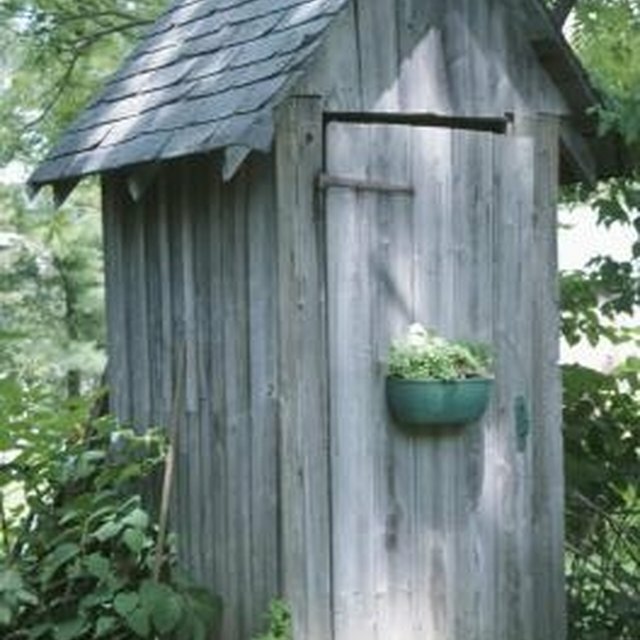 If you have an outhouse in your garden area, you can decorate it to create interesting garden decor. Expressing your personality and artistic talents, and making something beautiful out of an item that is no longer useful are reasons to convert your outhouse into a form of yard art. Outhouses can be transformed into quaint garden sheds. Research different styles of sheds, storage buildings and functional yard art to determine the theme you want to use when decorating your outhouse. For instance, if you want to give it a Victorian appeal, you can build a cupola on its top and add lace curtains and decorative wood trim to the exterior. Hanging horseshoes, a lariat or vintage gardening tools on the walls or doorway helps to imbue it with a rustic, country theme. Take down the door and use a jigsaw to create cutouts in the outhouse's door. The crescent moon, star and sunburst were symbols commonly used to decorate traditional outhouse doors. The wood cutouts provided ventilation, which is quite important in a building of this nature. Such a decoration gives the outhouse an authentic look. Hang vintage metal signs on the interior or exterior of your outhouse. Use aged newspaper or magazine clippings as wallpaper or frame them in antique-looking picture frames. Display old black and white or sepia photographs of your ancestors. Paint creative outhouse rules, such as time limits and notes on the conservation of toilet tissue, onto an old wooden sign. Hang burlap feed sacks or vintage-looking fabrics over the windows as curtains. For a funky, eclectic look, display decorative patio lights around the exterior of the roof. Indoors, hang an interesting swag lamp to provide light in the building. Install a skylight or hang a dutch door in the entranceway to create additional lighting and architectural interest. Single outhouses are typically small, usually around 3 or 4 feet wide and 7 feet tall, according to the Cowboys & Indians magazine. The installation of shelving units, pegboards and other organizational tools will help increase their function. Use your outhouse as a potting shed, a place to read or meditate, or to store large tools, such as chainsaws, weed-trimming devices or lawnmowers.